Pistons, Rings, Rods & Parts. Guaranteed to fit and meet the specifications of the OE parts being replaced. Utilizes the latest in design and material technology, ensuring quiet and maintenance-free experience. Produced under strictly observed quality under highest ISO 9001:2000 international standards. Advanced manufacturing technology ensures durability and optimum operation. Specialized designs yield significant and noticeable improvements to your car engine. Remark: The straight timing guide rail in this heavy duty timing kit is made with metal instead of plastic. 24/7 Support Ask product experts. The timing chain is located in the front of the motor and is attached to a set of gears and pulleys that power multiple mechanical components, including the crankshaft and camshaft. In order for your engine to fire, the timing chain must smoothly rotate around the gears without hesitation. Although the timing chain is made out of metal, it is subject to wear and tear and may break if not replaced as recommended by the factory. Since the timing chain can go bad and will need to be replaced, it is important to be able to recognize the symptoms so you can have it repaired before it fails completely. Your car will not start at all, indicated a complete timing chain failure. Be sure to use our aftermarket replacement timing chain kit when your timing chain is serviced for the best performance. 1 Timing Chain (96 links - single row). 1 Guide Rail Right (curved - plastic). 1 Guide Rail Left (straight - metal). 1 Cam Sprocket (36 teeth). 1 Crank Sprocket (18 teeth). 1 GMB Water Pump w/ Gasket. GMB is one of largest global manufacturers of OE and Aftermarket automotive products. Since 1943, GMBs manufacturing quality has been recognized within the industry beginning with Tensioner and Idler Bearings, Water Pump, Universal Joints. No exchanges will be made for any product that has been damaged, misused or improper installed. We always recommend professional installation of our products. 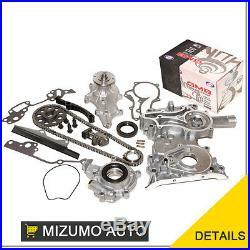 Mizumo Auto Providing quality OEM production replacement parts to engine rebuilders, specialty warehouses, and distributors for more than a decade. Our product lines represent affordability, quality, and performance to meet the demands of todays challenging market. In addition, Mizumo parts meet or exceed the strict standards of QS9000, ISO9001, and ISO9002. Our gasket line is manufactured with non-asbestos materials, the finest silicon rubber, Viton valve stem seals, and graphite or MLS (multiple layer steel) head gaskets for superior sealing. Our gasket product line provides our customers with competitive cost coverage on popular late model domestic applications. For all your early to late model import needs we carry a full range of gaskets and internal engine parts in addition to our new product lines of: Timing Belts & Kits, Water Pump, Head Bolts. Mizumo Auto is located in Southern California, the most diversified import automotive market in the nation, thus, allowing the company to continually study market trends to help forecast future product needs, and enhance development to exceed industry standards of both quality and performance. Mizumo Auto offers national sales and support services along with a fast program to insure our clients get the parts they need now. The item "Heavy Duty Timing Chain Kit Water Oil Pump Fit 85-95 Toyota Pickup 4Runner 22R" is in sale since Wednesday, December 21, 2011. This item is in the category "eBay Motors\Parts & Accessories\Car & Truck Parts\Engines & Components\Timing Components".